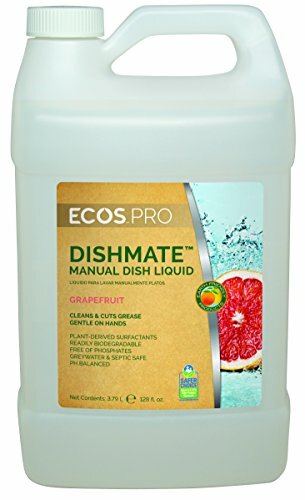 The Earth Friendly Products Proline PL9722/04 Dishmate grapefruit ultra-concentrated liquid dishwashing cleaner is a grapefruit-scented phosphate-free liquid detergent for manual washing of dishes, silverware, glassware, cooking utensils, and related items, and is made with biodegradable, plant-based active ingredients using a pH-balanced formula that reduces the risk of damage to surfaces. It comes in a one-gallon plastic bottle for efficient storage when filling a dispenser (sold separately). This product is safe for greywater and septic systems. Earth Friendly Products manufactures household and commercial cleaning products. The company, founded in 1989, is headquartered in Addison, IL. If you have any questions about this product by Earth Friendly Proline, contact us by completing and submitting the form below. If you are looking for a specif part number, please include it with your message.